Astronomy magazine called this scope’s predecessor, the 66mm Astro-Tech AT66ED, “a product everyone should own." The new Astro-Tech AT72ED upgrades that best-selling predecessor by increasing the aperture to 72mm to give you 9% higher resolution and 19% more light gathering; upgrades the focuser to 2", with a 1.25" adapter; and increases the focuser travel to 80mm to allow imaging with a wider variety of camera types. Astronomy said the AT66ED was “a great grab-and-go scope, a fine little astrograph, a super-finder scope, and a daytime spotting scope." The same is equally true for the new AT72ED. The lowest useful power is 11x, achieved with a 40mm eyepiece. At 3.8x per inch of aperture, this is very close to the 4x per inch of aperture generally regarded as the lowest practical power with any telescope. A 40mm eyepiece on the AT72ED will give you a 6.67mm exit pupil, larger than most eyes can dilate. Any lower power would simply waste some of the scope’s light gathering capacity, as its collected light would fall on your iris, rather than entering your eye. 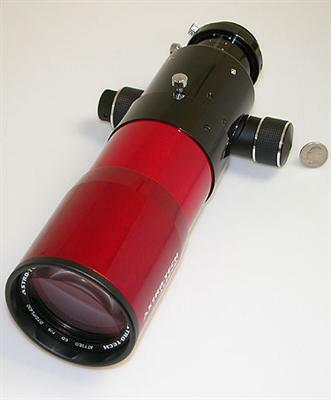 Tube finish: The optical tube is finished in a durable liquid red anodize with anodized black trim that makes it an excellent choice as a photoguide scope to mount on a large Celestron catadioptric. Click the button below to add the Astro-Tech AT72ED 72mm f/6 ED Doublet Refractor (Red) to your wish list.